When I first started low-carb cooking, my son-in-law gave me a challenge. He said if I could find a good substitute for french fries, he would consider trying my diet. (He eventually did anyway.) I fried all sorts of things, animal and vegetable, with varying degrees of success. Several of the recipes in my first book, Carb Wars; Sugar is the New Fat, came from these experiments. One of the things I tried was lotus root. I used the prepackaged slices from an Asian market the first time, but the slices were too thick and I wasn’t happy with the results. When a local grocery started selling the fresh roots, I decided to give it another go. I made these yesterday for Easter dinner. Everyone liked them, even the kids. Tip: Fresh lotus roots look like stiff strings of fat, pale brown sausage links. They break apart easily at the narrow joints. They can be stored in the refrigerator for up to two weeks. The chips have very little taste of their own, so you can spice them any way you like. They are more beautiful and exotic than potato chips and have fewer carbs in the bargain. They are sturdy enough to use for dips or like a cracker. Peel the roots with a vegetable parer and cut into very thin, uniform rounds with a mandoline or a chef’s knife. Drop the slices in a bowl of water with some lemon juice added to prevent discoloration. Dry well on paper toweling before frying. Heat oil in a deep fryer set on high (375 degrees). Deep fry in batches for 2 to 3 minutes or until golden brown. Drain on paper towels and sprinkle with coarse salt and freshly ground pepper. Alternately, toss with chili powder, smoked paprika, or other spices. Store chips in airtight container. 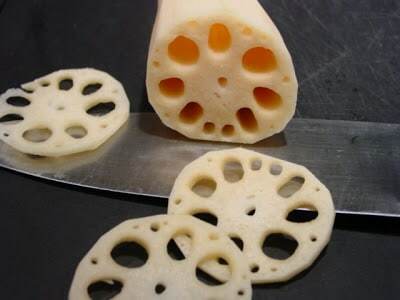 Eight slices of raw lotus root weigh about an ounce, which comes out to 0.37 Net Carbs per chip. Fries, Lotus root chips. Bookmark. Those look great! I’ll have to try some soon. We like thin slices of deep fried Jicama in place of chips as well. Thanks Judy! I am rackon from chennai, India. I saw ur blog and what attracted me was ur lotus root fries. Now i think you r cutting/slicing and frying it. 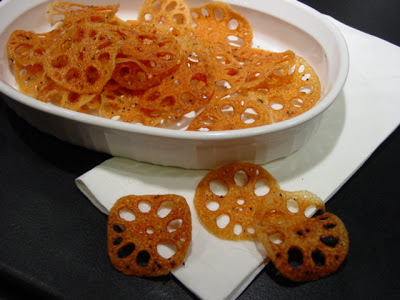 In india and particularly in souht india we use lotus root as chips for generations. What we do is when it is available in the season we buy, slice and boil it in waterwith salt or steam it with salt and sun dry it. After drying in the sun for one day you can mix it with a paste of chilli powder to your taste and continue drying it for 2-3 days in good sunlight till it is totally dry and black. This you fry and enjoy. I swear, it will out beat any of the french fries or any other MNCs fast food junk. It is rich in fiber with practically not much of calories and shoud be a very healthy stuff and will help even to lower blood sugar as it fills the tummy and you cant each much of your regaular food stomach full. It can be a perfect replacement for the potato wafers and it will stll be very very healthy. Trust you will find this interesting. Thanks for the suggestion! I will definitely try it your way. wow.Thanks a lot for your tips. I was long searching for a good lotus root recipe and you have provided me one. I was told by my friends that lotus roots are very good for lungs and reduce blood pressure. But I am not sure if those properties are retained when deep fried. However I think they must be better than potato fries. Thanks Rackon for the tips/suggestions. I'm definitely going to try that option as well. Where do you get lotus root? I have looked in our grocery stores and do not find it, all I have seen is Yucca root. Hi Littlered. Look in the fresh produce section with the Asian vegetables, like daikon. Smaller stores or ones in areas that don't have many Asian residents may not carry it. I've also seen slices in packages displayed with the tofu, but they may be too thick to fry for chips.